For the first time since she relinquished the Miss World Philippines franchise in 2016, Cory Quirino finally breaks her silence as to why she resigned as the national director. One reason. She felt bad when Catriona Gray lost in Miss World 2016. Gray competed in Miss World 2016 and placed in the Top 5. Two years after, she competed in Bb. Pilipinas and earned the right to compete in Miss Universe which she eventually won. 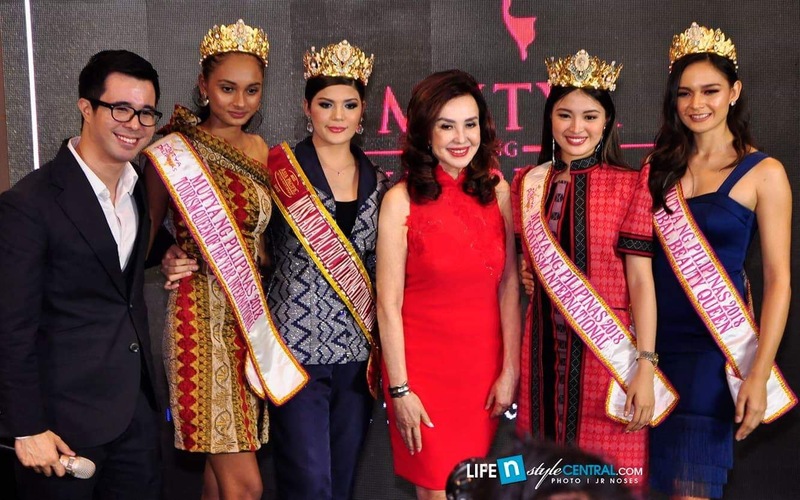 This was revealed by the famous beauty and lifestyle guru during the Mutya ng Pilipinas press launch held on March 27 in Ascott Hotel Makati. She is formally presented to the press as the newest president of Mutya ng Pilipinas. “The message and the news is true. Cory is back. After three years of hiatus, retreat or what you say vacation from the beauty pageant scene.” Cory addressed to the press. Quirino also revealed what made her accept the Mutya ng Pilipinas directorship. “It was after Christmas (2018) when I got a call from Ogie (Alcasid) and he said let’s talk. I have a friend who wants to meet you. We went to Fred’s house (Fred Yuso, Chairman of Mutya ng Pilipinas). I thought it’s just an ordinary meeting. Sa tototo lang, ang buong Board of Director ng Mutya ay nandoon. So I said is this a casual meeting or is this an official meeting? Sabi ni Fred, we will not accept “No” for an answer. I said ok pag isipan natin, let’s meditate. Let’s talk about it in the New Year.” said Quirino. “There is only one thing that motivated me or actually to inspired me to go back to pageantry and that is one thing that Fred said to me. He said ‘What is the one thing that you have always wanted to do in pageantry but failed to do?’ Actually I said I tried but I was not able to accomplish it. My initial dream was very organic, was really to look for that hometown girl. I didn’t realized that it was also the dream of Fred. It was also his biggest frustration. He said we want to widen the advocacy of Mutya ng Pilipinas. Hanapin nga natin yang “hometown girl”. Bigyan natin siya ng pagkakataon na ma discover at maging isang di lang maging beauty queen kundi pati na ‘rin baka TV star, movie star, newscaster. With all our connections in the business world, she will have a promising career.” she added. Cory Quirino with the Mutya ng Pilipinas 2018 reigning queens and her nephew Justin Quirino. Meanwhile, Mutya ng Pilipinas President Fred Yuson revealed that they used to send girls to Miss World and Miss International pageants. 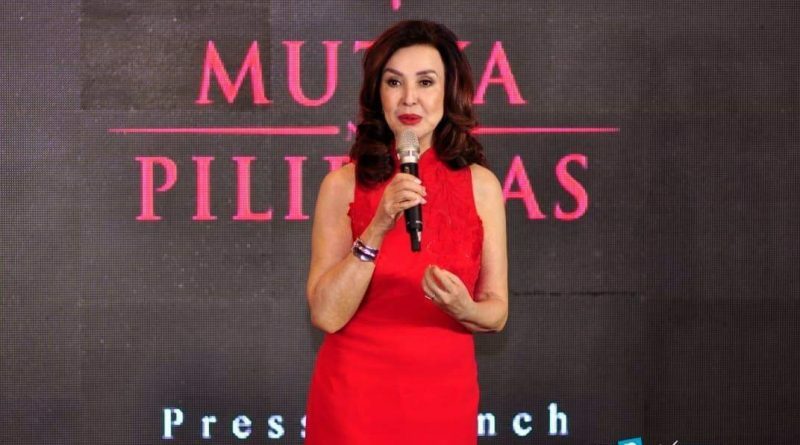 He is confident that with Cory Quirino’s passion and leadership, Mutya is bound to gain everything back these aforementioned brands even Miss Universe, in due time. Quirino will be joined by singer-songwriter Ogie Alcasid. Alcasid is the newest addition to the Board of Directors. He is tasked in the direction and production of the pageant production throug his production company, A Team. To widen the pageant’s advocacy and campaign, they have formed an alliance with the Department of Interior and Local Government (DILG) and the League of Barangays in the Philippines. The three organizations also signed a Memorandum of Understanding during the press launch. 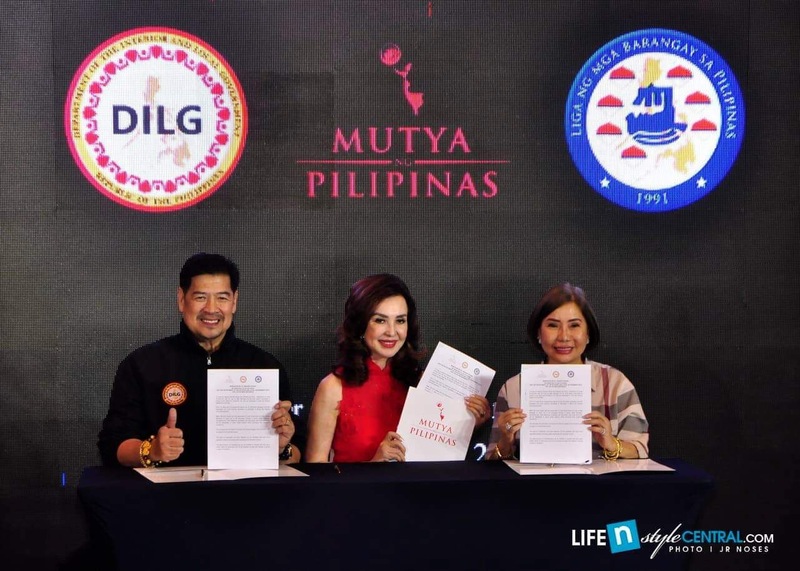 Mutya ng Pilipinas President Cory Quirino signs a ‘Memorandum of Understanding’ with DILG Undersecretary Martin Diño and Liga ng mga Barangay President Eden Chua-Pineda. The official search of the annual Mutya ng Pilipinas will begin in April 2019. Coronation night is set in August 2019 at MOA Arena.